Take a look inside designer Malene B's Brooklyn home. Malene Barnett is every bit the modern-day renaissance woman. She transformed her passion for fine art, sculpture, and painting into a career designing custom rugs after studying textile design at the Fashion Institute of Technology in New York. Her brand, Malene B, which she launched in 2009, encompasses her many talents and “blurs the line between where art stops and design begins,” she explains. It took a year and a half to renovate the brick-front Queen Anne that she took on as a “total wreck,” complete with squatters and holes in the roof. But after doing the nitty gritty behind-the-walls work, she took the two-floor, two-bedroom property from “hot mess” to Caribbean cool, using a bright color story as her design compass. Starting with a statement-making turquoise front door, she carried her favorite color into the entryway where teal walls frame a tangerine staircase and a sunset-orange ceiling. For the wood floors she used a seafoam stain, lending a dreamy, seaside quality throughout. “It feels like you’re walking on water,” says Barnett. Painting every surface with no white space left in sight gives the eye plenty to take in without being overwhelmed. Barnett laughs that there was no fancy technique except for having an old-fashioned roller at the ready. But she does admit that using one tone, her signature vivid aquamarine, and fading it slightly room by room creates a subtle ombre. The same teal stretches across the living room, taking on a greater vibrancy when layered with Barnett’s graphic custom rugs, bold artwork, vintage couches, and mudcloth textiles from Africa (which she strategically tucks into the back of her couch for a tailored upholstery look). Dark woodwork gives contrast while gem-toned glassware ties in the breezy palette of blues, yellows, and greens. Barnett shops tag sales, consignment shops, and stoop sales for an eclectic array of furnishings. “I like collecting what people throw away!” she laughs. 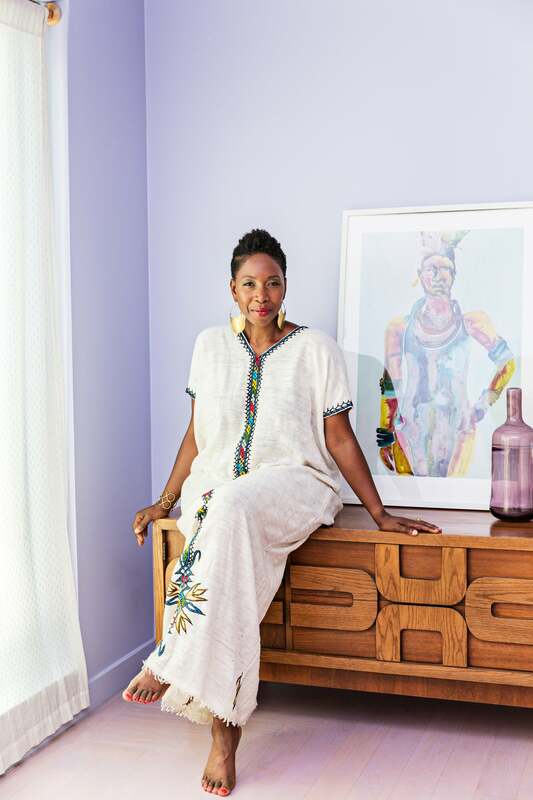 Her mix ranges from a vintage yellow velvet couch to heirloom consoles to big box mirrors, and it all works with her bold palette and more-is-more mentality. In the kitchen’s breakfast nook she had inset niches built into the wall to display her art and curio collections from travels. Rather than use shelves that jut out, these stay flush with the wall, making the room feel even bigger. Teal pops up again in the hex tiled backsplash and accessories, with everything a few shades lighter than the adjacent living room. Using this gradient technique, the color story continues to the bathroom, which is nearly all white. Here a custom vanity was built to look like an old Chinese cabinet and a freestanding soaking tub rests in the middle of a mosaic surround. The pale monochrome is a moment of quiet in a house full of color—however, Barnett’s approach was exactly the same as with the paint; there is no blank space. “All surfaces are equal, there’s no separation between the floor and the wall,” she explains. The white tiles are reflective and pick up on surrounding tones and textures, such as the bright yellow stool and wicker accent pieces. The master bedroom moves into notes of lavender, which is again, everywhere—walls, ceiling, doors, and even the stain on the floor. Barnett chose the hue for a calming, restful effect, one that also reminds her of the Caribbean and Jamaica, full of flowers and black sand beaches. Her bed is topped with Malene B pillows, and a cool console scored in Brooklyn displays more of her artwork that nod to the palette in the rest of the house.